We had a fantastic pack meeting on October 7! First, we had a special guest, Mr. Adam O'Connor from ATA Martial Arts, who gave a great presentation on bullying prevention and how to handle a bully. Then, we had our Bobcat ceremony! All of our new Cub Scouts, from Tigers to Webelos, were awarded their very first rank. 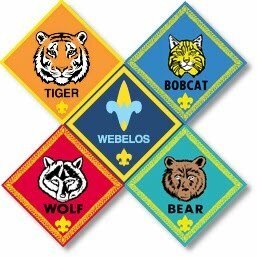 All of us at Pack 121 are very proud of our new Bobcats! Business items covered included popcorn sales (keep selling until the 21st--all money and forms due by then! ), and recharter. If you haven't renewed your charter with Cub Scouts, contact Joan or Dave for information on how to do that. Remember, Pack 121 will not be holding meetings at Elm Tree Elementary School on October 14 or 21, due to Elm Tree being closed for intersession. Check with your Den Leader to see if your den might be meeting at an alternate location on these dates!